In his sculptures Daniel Bragin creates unpredictable, awkward material juxtapositions; conveying an utterly deadpan economy of means, they also stand as slightly tongue-in-cheek objects celebrating a child-like joy in making. The windshield glass and PVC strings that compose Bedtime Story are almost opposites in the artist’s view. 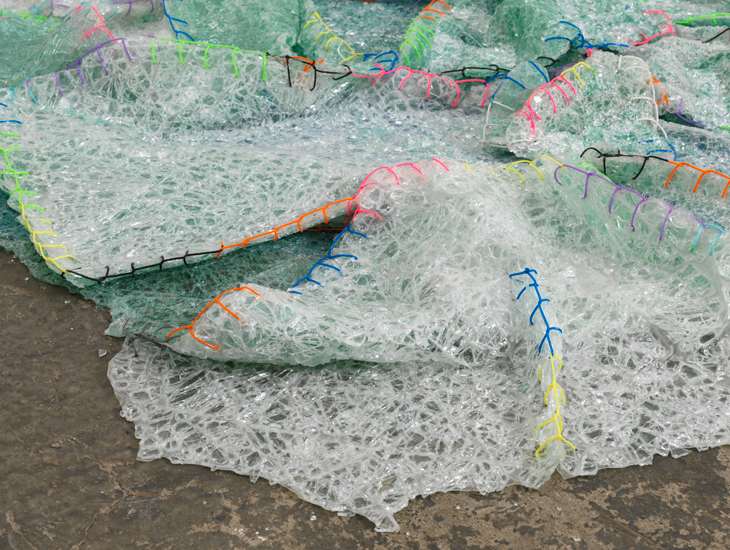 We associate shattered glass with car accidents, violence against shops and social riots, but here, sheets of it have uncannily been patched and finished off with candy-coloured plastic threads, the same kind that children use to make friendship bracelets. The resulting fusion of the two elements is a strangely innocent but uncomforting, even nightmarish, sheet or ‘blanket’, an alluring visual oxymoron “leaving a trace of cold gaiety, perhaps even in the eyes of the child”.